Please note that ID Armor has been discontinued and is no longer available. You can read our old review of ID Armor below, or check out the rest of the Identity Theft Protection Services we've reviewed. 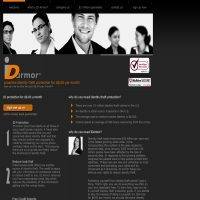 ID Armor is a US-based service that is a relative newcomer to the consumer identity theft protection market. Established in 2007, ID Armor is simply too new to be accredited by professional organisations, such as the Better Business Bureau (which is a 'goes without saying' standard for most companies in this category). ID Armor offers a very simple service, and thus is rightly one of the cheapest services we have reviewed in this category. ID Armor provides a 'no frills', basic service and thus is perfect if you're looking for the most basic level of protection. If you're looking for a service that will provide additional features, or provide cover for your family, you're looking in the wrong place! The current subscription cost is $8 per month per adult member, though this has increased significantly in the past year (from just $1.99 per month per adult in 2008), so we would certainly suggest keeping an eye on this site to check you don't start paying over the odds for a relatively mediocre service. In terms of features, ID Armor is undeniably limited. ID Armor requests that fraud alerts are placed on each of the three major credit union files with respect to the user, so that any new requests or applications for credit automatically require authorisation from the user. While this service does provide some advanced warning of the potential threat of identity theft, and can in many cases stop the crime from occurring, this does not stop those elements of identity theft and associated fraud that happen outside the channels of a normal credit application. Users of ID Armor also get a free annual credit report, compiled in the (fairly commonplace) 3-in-1 format (combining the efforts of Experian, Equifax and Trans-Union). These reports not only give you a great indication of your credit rating and financial situation, but also help you to identify any anomalous transactions or applications that may be evidence of fraudulent activity. One of the most disappointing elements of ID Armor is that there is no attempt at offering Identity Theft Recovery Assistance, and although there is a $1Million guarantee on the ID Armor service, we couldn't help but feel that this left users a little in the dark if the worst should happen. All in all, ID Armor is an extremely simple service that offers users the most basic protection in Identity theft prevention. Even though it's still relatively cheap, we are not convinced that it's worth the current subscription fee. It seems that while the subscription fee has taken a substantial jump since 2008, the features offered in return haven't improved to the same extent. We would definitely recommend checking out other services that, while often more expensive, will provide a wide range of features that will contribute to a far more encompassing service. For comparison, check out LifeLock, our highest rated service in this category which, for a slightly higher monthly subscription fee, offers a much more developed service, with a range of useful additional features. Please note that ID Armor has now been discontinued.